The cylinder must be encased in an assembly of polyvinyl chloride (PVC) pipe. The pipe wall thickness must not be less then 0.03 inches. 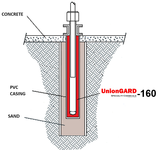 The inside diameter of the pipe should be large enough to allow not less then one inch (1") of UnionGARD 160 to completely surround the cylinder. The PVC pipe assembly must be capped at the bottom and all joints must be solvent welded or heat welded according to the pipe manufacturer's recommendations to insure water tightness. The elevator shaft must permit the cylinder and PVC casing to be set plumb in the proper location. Install the pipe and cylinder assembly in the shaft and obtain set plumb location. Back fill the outside of the PVC casing with clean sand and simultaneously fill the inside of the annulus with UnionGARD 160. These operations must be performed simultaneously in order to maintain pressure equilibrium on the PVC wall. The hydraulic cylinder may touch the PVC pipe to obtain vertical plumb. Seal the well opening at the pit floor with hydraulic quick-setting cement. An inspection orifice must extend through the cement seal into the annulus between the PVC pipe and the elevator cylinder. Rheology: Product viscosity low enough to pump with low pressure equipment. Gel strength high enough to suspend fine solids indefinitely when static. Filtration: High colloid concentration prevents filtration at ambient temperature and acts with the gellant to resist seepage. Temperature Control: Insulating properties manage operating temperatures of the hydraulic fluid oil by storing peak temperatures throughout the underground assembly.